The human gastrointestinal tract is home to a dense population of microbes constituting members of the three domains of life (Bacteria, Archaea, and Eukaryota). The microbial community within our gut impacts many aspects of normal human biology and represents a phenotypic lever that we can use to modulate aspects of human health and disease. A key mechanism by which the microbiome influences human health is through the production of bioactive metabolites. Our laboratory is focused on understanding metabolic strategies for small molecule production by gut bacteria with the ultimate goal of establishing new approaches to promote human health and treat disease. Human blood contains hundreds of exogenous chemicals, a large portion of which arise from bacterial metabolism within our gut microbiome. Many of these compounds have drug-like properties; they engage specific cellular receptors, alter transcriptional profiles in host cells leading to changes in cellular and organ physiology, and ultimately, modify human health or disease progression. We are using mass spectrometry-based metabolomics to define the microbial contribution to the human metabolome and by studying these molecules, we aim to identify human phenotypes that can be modified by modulating the gut microbiota. Ultimately, these studies will enable interventions that leverage microbiome function to promote human health. 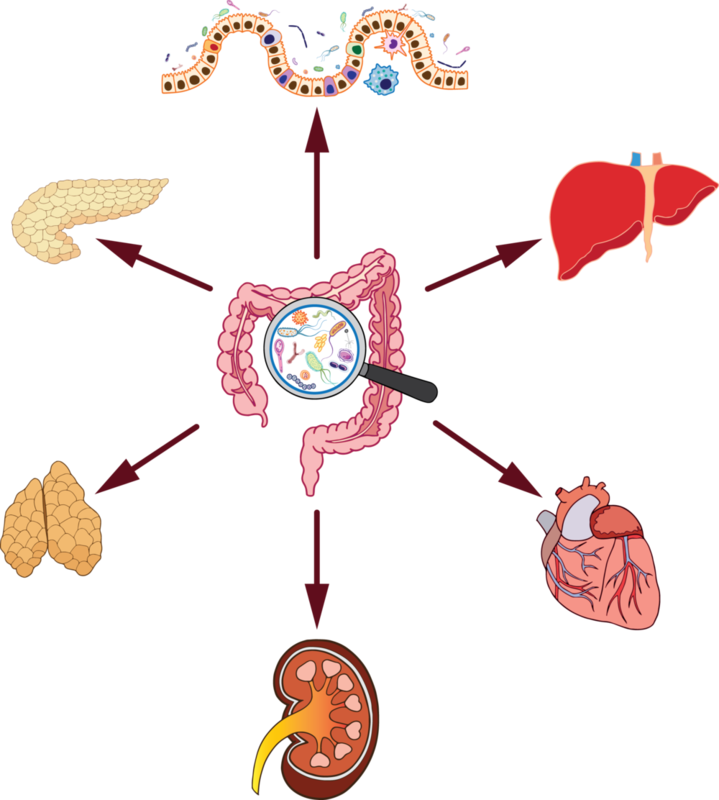 The human gut microbiome influences the physiology of numerous organs throughout the body. However, the mechanisms that form the basis of host-microbe interactions at the organ and systems level are poorly defined. Emerging evidence suggests that microbial metabolites are important effectors of host-microbe interactions. To this end, we are interested in addressing the following questions: 1) What is the repertoire of circulating microbial metabolites? 2) How do microbial metabolites influence cellular physiology and organ function? and 3) What is the fate of microbial compounds in the host? Answers to these questions will provide important insight into the landscape of host-microbe interactions at the molecular, cellular, and organismal levels. Mapping microbial pathways for disease-modifying metabolites. Increasingly, gut microbial metabolites are being causally implicated in human disease; however, the microbes that produce them and the pathways they use are in many cases entirely unknown. Using approaches in computational biology, microbial and host genetics, and chemical biology, we will study important microbial metabolites to answer the following questions: 1) What microbes in the gut produce these chemicals? 2) What are the set of microbial genes responsible for production of the these compounds? and 3) How do these metabolic pathways fit into the biology of the gut microbial ecosystem? This knowledge will enable us to establish concrete connections between microbes, gene clusters, and metabolic potential. Using synthetic biotics to improve microbial community function. Transplanting whole microbial communities from healthy donors has proven to be an effective approach for treating human disease, especially in the context of C. difficile infections. Given how broadly the microbiome influences organ systems in the body, there is a wide range of therapeutic applications ranging from cancer immunotherapy to cardiovascular health and metabolic disease. However, due in part to heterogeneity across donor microbial communities, establishing predictable phenotypic changes in humans following microbiota transplant is a major challenge that limits the generalizability of this approach. We aim to use quantitative approaches to understand how desirable phenotypic characteristics can be effectively maintained following assembly and transplantation in mice and in humans of defined synthetic biotics. Outcomes from these studies will enable development of next-generation microbiota-based therapeutics to treat a wide variety of human diseases.